Michelin’s Latitude Sport is a sport truck summer tire. The Latitude Sport tire was developed for original equipment use on some of the world's most prestigious high performance crossover and sport utility vehicles. 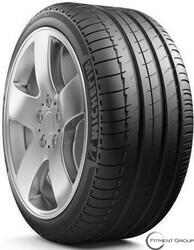 Michelin’s Latitude Sport tire is designed to deliver the best dry and wet road traction, handling and cornering. The Latitude Sport, like all summer tires, it is not intended to be used in near freezing temperatures, in snow or on ice. Michelin’s Latitude Sport tires share the asymmetric tread pattern and dual tread compounds of Michelin’s Pilot Sport PS2 Max Performance Summer tires for passenger cars. The Latitude Sport features a hybrid silica and carbon black tread compound that begins at the tire's outboard shoulder and continues across the tread to increase dry traction where a high silica compound continues to the tire's inboard shoulder to increase wet traction. The Latitude Sport also has large outboard shoulder blocks along with continuous intermediate and center ribs that increase steering response and cornering stability. The Latitude Sport features wide circumferential grooves and lateral notches that help cycle water to enhance wet road traction. The Latitude Sport tires’ internal structure includes two high-tensile, steel cord belts that are further reinforced by individual aramid nylon hybrid filaments that resist tire distortion to provide high-speed durability and increase ride quality.